PostmarketOS began work on a real Linux distribution for Android phones just over 600 days ago. They recently blogged about the state of the project and ensured us that the project is definitely not dead. PostmarketOS’ overarching goal remains a 10 year life-cycle for smartphones. We previously covered the project on Hackaday to give an introduction. Today, we’ll concern ourselves with the progress the PostmarketOS team has made. The team admits that they’re stuck in the proof-of-concept phase, and need to break out of it. This has required foundational changes to the operating system to enable development across a wide variety of devices and processor architectures. There’s now a binary package repository powered by builds.sr.ht which will allow users to install packages for their specific device. Other updates include fixing support for the Nexus 5 and Raspberry Pi Zero, creating support for open source hardware devices including the Pine A64-LTS and Purism Librem 5. PostmarketOS now boots on a total of 112 different devices. We’re excited to see the PostmarketOS project making progress. With the widespread move to mobile devices, users lose control over their computing devices. PostmarketOS gives us the ability to run code that we can read and modify on these devices. It’s no small feat though. Supporting the wide variety of custom hardware in mobile devices requires a lot of effort. While it may be a while before PostmarketOS is your daily driver, the project is well suited to building task-specific devices that require connectivity, a touch screen, and a battery. We bet a lot of Hackaday readers have a junk drawer phone that could become a project with the help of PostmarketOS. A mill is one of those things that many hackers want, but unfortunately few get their hands on. Even a low-end mill that can barely rattle its way through a straight cut in a piece of aluminum is likely to cost more than all the other gear on your bench. A good one? Don’t even ask. So if something halfway decent is out of your price range, you might as well throw caution to the wind and build one. 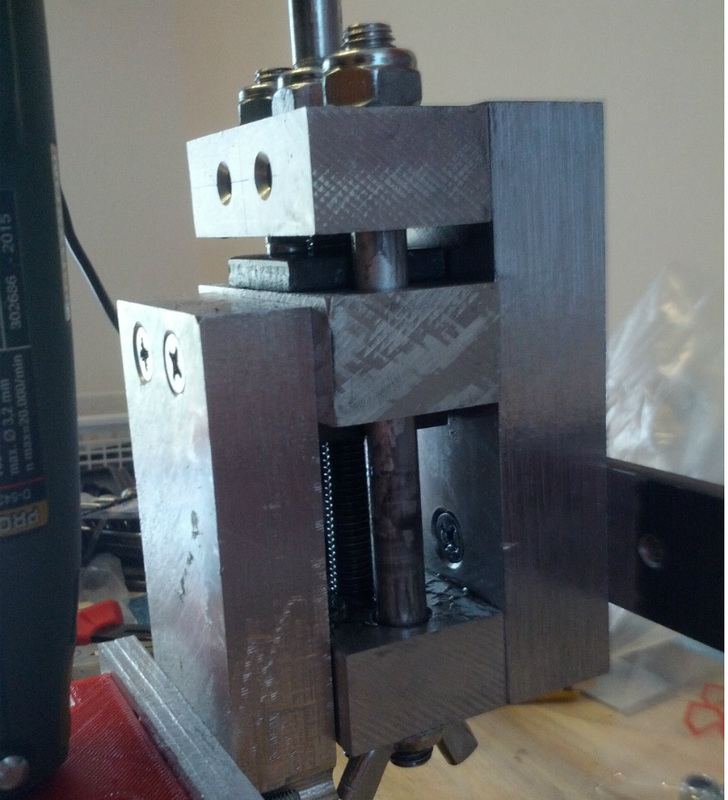 That’s more or less the goal behind this extremely basic three axis mill built by [Michael Langeder]. Designed around a cheap rotary tool, it’s hard to imagine a more simplistic mill. Almost all the components are stuff you could pick up from the local hardware store, or probably even the junk pile if you were really in a pinch. It won’t be the best looking piece of gear in your shop, but it’s good enough to learn the basics on and just might be able to bootstrap a second-generation mill RepRap-style. Made out of scrap blocks of aluminum and some threaded rod, the Z axis itself represents the bulk of the work on this project. It gives the user fine control over the height of the rotary tool by way of a large knob on the top. It’s held over the work piece with some flat steel bars and corner brackets rather hastily cut out of aluminum sheet. While the tool holder is 3D printed, you could probably hack something up out of a block of wood if you didn’t have access to a printer. The only part of the mill that’s really “cheating” is the cross slide table, but at least they can be had for relatively cheap. If you really wanted to do this with junk bin finds, you could always replicate the Z axis design for X and Y. If you’re not looking for something quite so austere, we’ve covered slightly more advanced DIY mills in the past. You could always go in the opposite direction and put a cross slide vise on your drill press, but do so at your own risk. If you doubt the power of the Hackaday community, check this one out. Stalwart reader and tipster [starhawk] has pitched in to help a friend in need, someone he met through Hackaday.io. Seems this friend’s current living arrangements are somewhat on the cramped side, and while he’s in need of a PC, even a laptop would claim too much space. So with a quick trip to the store and a few items from the junk bin, [starhawk] whipped up an all-in-one PC the size of a tablet for his friend. As impressed as we are by the generosity, we’re more impressed by the quality of his junk bin. The heart of the compact machine is a motherboard from a Wintel CX-W8, scarcely larger than a Raspberry Pi model A. After the addition of a larger heatsink and fan, the board was attached via a sheet of plastic to the back of a 7-inch touchscreen, also a junk bin find. A cheap picture frame serves as the back of the all-in-one, complete with Jolly Wrencher, of course. Alas, the DC-DC converter was one of the only purchased items, bringing the cost for the build to all of $22, including the $15 for a wireless keyboard/touchpad on clearance from Walmart. After some initial power troubles, the fixes for which are described in this update, the machine was ready to ship. Does this one seem familiar? It should — [starhawk] built a similar “laptop” for himself a while back when he was low on funds. Now it seems like he’s paying it forward, which we appreciate. For more details on how he pulled this all of, check out The Anytop, [starhawk’s] portable computer anyone can build. It was his 2017 Hackaday Prize entry!